About 300 people watched the 10 monks strut their stuff in Nara Prefecture, drawing "cheers and adoration mainly from women in the audience", The Asahi Shimbun website reports. It was held to promote nearby Mount Koya, also known as Koyasan, the centre of Japanese Shingon Buddhism. 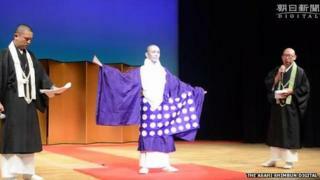 The show's theme was "beautiful Buddhist monks", with the models chosen from among the ranks of a young teachers association. "All of the monks are really handsome. I was excited," one woman tells the website. But for one of the monks-turned-models, it was a slightly nervier affair. "I was little bit embarrassed," Shuchi Matsuki says. "But I enjoyed playing the role of a model." The outfits on show have rarely been seen by the general public, and included pieces ordinarily worn only by high-ranking monks, the report adds. The Koyasan Shingon Buddhism sect was established on the mountain about 1200 years ago by the Japanese monk Kukai - posthumously known as Kobo Daishi. The town of Koyasan now has more than 100 temples, with many offering overnight stays to visitors who want to experience the monks' lifestyle. The area is also recognised by UNESCO as a World Heritage Site.